After your custom pool is designed, the building process begins. From laying out the pool to the startup process and all of the steps in between, Eagle Pools, Inc., takes pride in our construction and craftsmanship. We employ only the highest standards of construction technology and will not cheapen or compromise the quality of our product in any way. The building process starts by evaluating your site. Some things we take into consideration are the logistics of getting equipment onto your site, the grade or slope of your yard, and groundwater conditions. 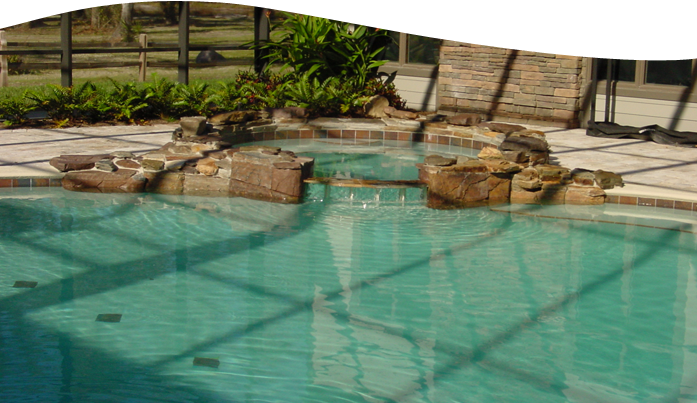 We then stake out your pool design and construct a form to the exact size and shape of your pool. You will be able to see exactly where your pool will be located at this stage. Next, we excavate and shape the interior of your pool. Steel reinforcement goes into the formed hole in a grid as well as PVC piping. Shotcrete or gunite is pneumatically sprayed on top of the steel grid to build the pool shell. You get a better idea of what your pool, including any sunshelves or swimouts, will eventually look like at this stage. The waterline tile and PVC circulation piping are installed next. The deck area is then formed and graded to insure proper slope and drainage. For acrylic decks, concrete is formed and poured over a steel reinforcement grid. Expansion joints are placed strategically around the deck approximately every 8 feet. An acrylic paint is then rolled over the concrete. For pavers, a sand base is tamped down and pavers in your choice of material, color, and pattern are laid. Equipment is installed, electrical connections are made, and your safety item (alarms on doors and windows or a safety fence around the pool) is installed followed by the interior plaster. As soon as the plaster is troweled on, the pool gets filled with water. Over the next 30 days or so, the plaster will cure. During this time, we maintain the pool, making sure that the interior surface is brushed frequently and the water is properly balanced. We will then schedule a time for "pool school" where you will learn how to care for your pool.